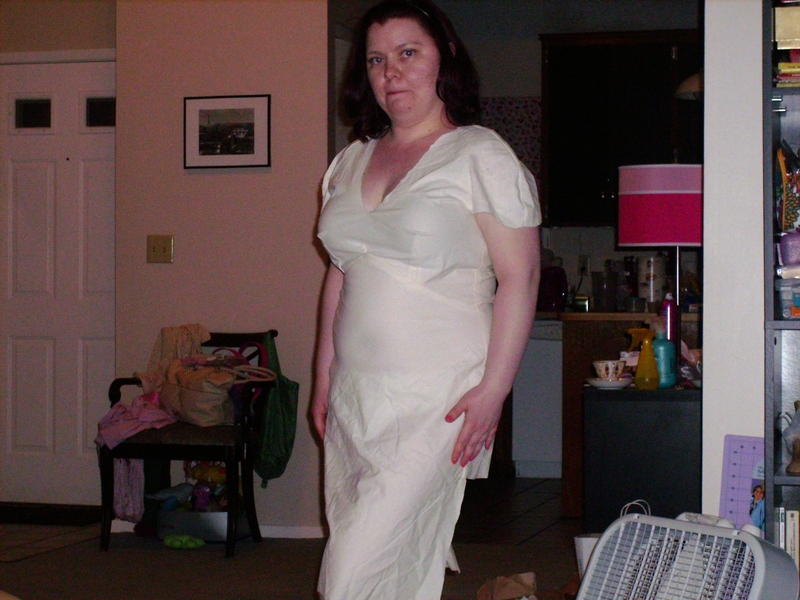 So, last night I was able to finish up my muslin of Butterick 5710. I wasn’t certain of any fitting changes I needed to make so I figured to test a straight size 14. From what I can tell, it doesn’t look like I need any major fitting changes. If I change the side seams to a quarter of an inch, I think it will work well. Anything someone thinks I should consider? I think the bubbles on the back are from inserting a zipper without stretching the bias or putting interfacing on the seam to help the zipper. 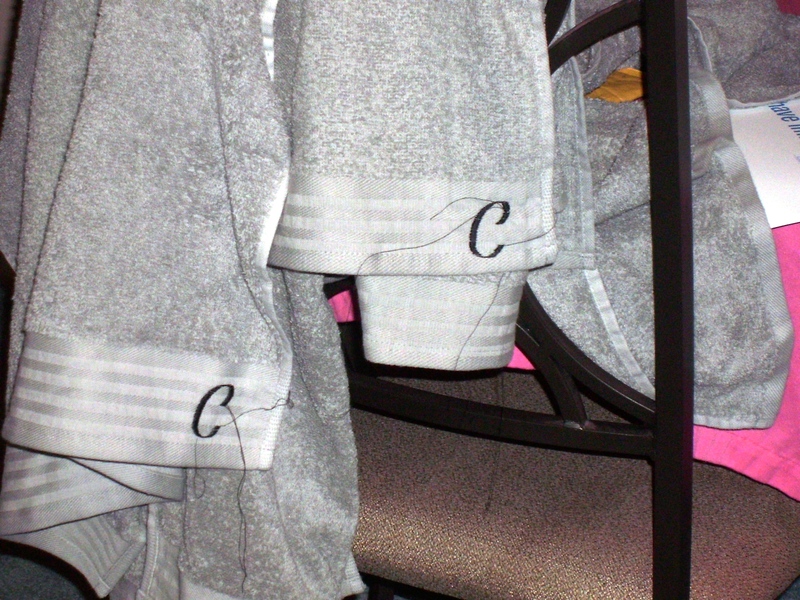 Besides working on the Butterick pattern, I found perfect towels to monogram for my bathroom. I still have two towels left to complete. Tonight, I probably won’t get to work on my dress since I need to make strawberry shortcake to take to work. I am using my favorite recipe from Jennifer Patterson of the Two Fat Ladies. Don’t let the sweet looking dress on the Vogue 2960 pattern envelope fool you. This dress has more bite than one would realize. I think it has became the monster under the sewing table. I gave it a good try but it just was not meant to be. I found a linen in the spot the bolt sale. I loved that it was a colorful floral and the fabric seemed to scream make me into a dress (preferably a full skirt one). Originally $20 a yard, I got it for $4.00 a yard which worked out perfectly because I probably needed around 5 yards for a 1950’s style dress. Somehow the stars seemed to be aligning. Before I even made a muslin, I had my dad measure ten inches from the back of my neck to see where the scoop came to. The original pattern has the scoop going below my bra band, so I went ahead and raised it an inch when I cut out my first muslin in a size 14. It didn’t turn out well at all. 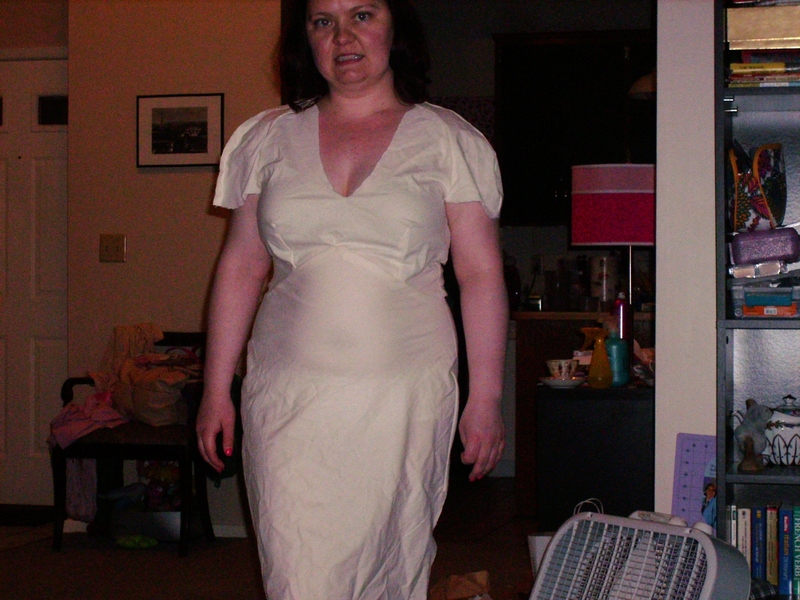 Shoulders were falling off of me and I think I sewed the front facing wrong (maybe?). I was afraid that there would be a lot of fitting work that would need to be done. So then, I went ahead and checked out some other Vintage Vogue pattern. I still came back to 2960 as my favorite. Sort of solidify that I really want to put in the effort of all the fitting work before doing it. I traced the bodice pieces on my roll of tracing paper. As I was tracing, the only pattern change I made was make the shoulders a 12 instead of a 14. I then picked out a second marker color and raised the scoop on the back pieces. I got to use my brand new design ruler that I picked up at Joann’s in January. The curves were so much easily to draw out. I may have to get another one as a backup. 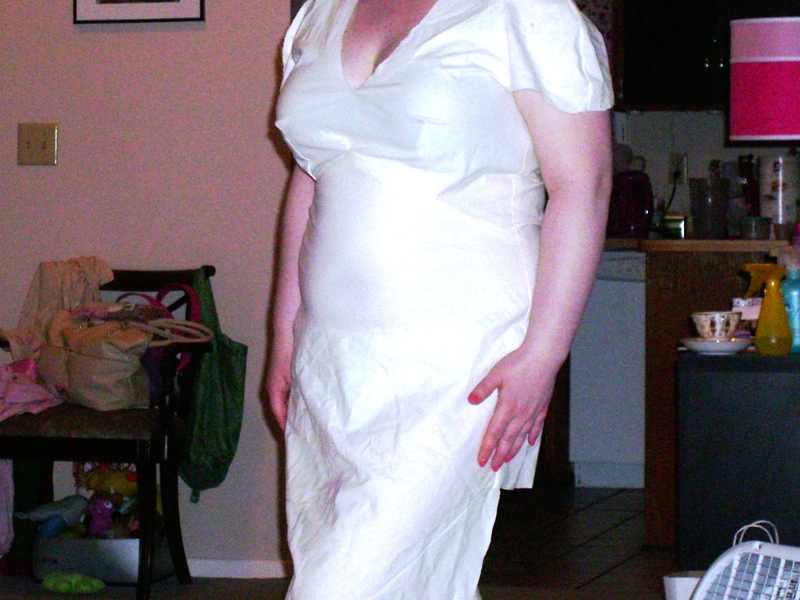 But this muslin didn’t really fix any of the problems I had. It was still too far wide in the shoulders and too tight in the arms. I didn’t even bother sewing the darts for the waist after that. Those probably would have been too tight too. So by this time, I am at the point of not knowing what to do to get the fixes I need beyond re-drafting the entire pattern. I don’t think my sewing and fitting skills are ready for that type of challenge yet. Some monsters will just have to continue lurking in the corners of the sewing room. I am not prepare to conquer them yet. So going back on-line, I needed to pick out a new pattern. 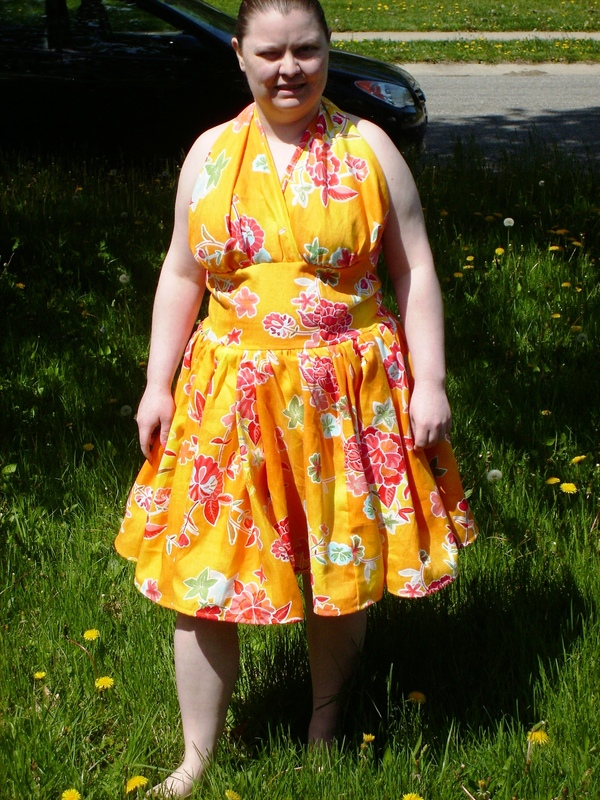 I still want the full skirted style but no wide neckline now since I had troubles with Vogue 2960 already. So instead I went with the halter neck style of Vogue 2962. I shouldn’t have troubles with the shoulder area on this one. This is very fitted but the sizing seems large on the bust. I was able to use a size 12 for the bust area. Then I graded out to the 18 for the waist. I did have to go back and pinch in an extra dart in the back. I probably need to pinch out some more in the back too. 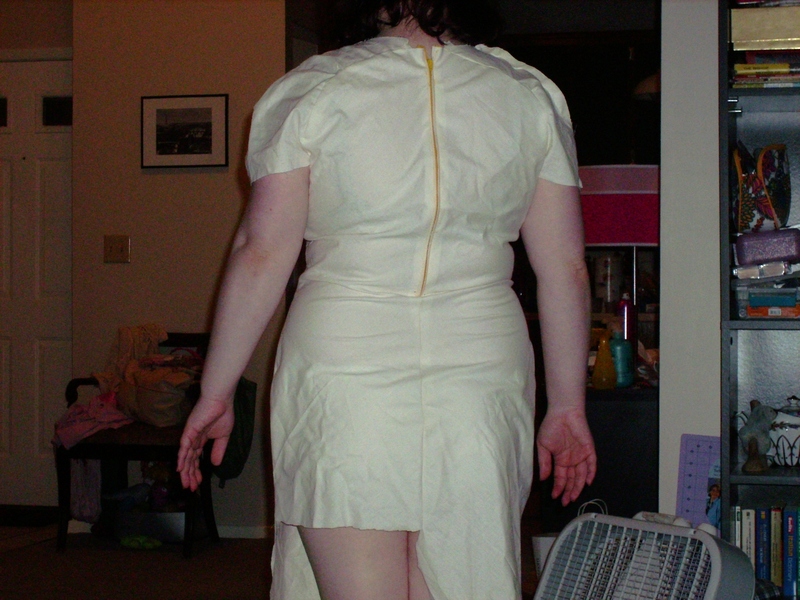 I think that when I raised the back so it wasn’t too low, I caused all the problems with the back of the dress. My other major design change was to switch the back closure from buttons to a zipper. Seeing as I live by myself, buttons would not be so easy to fasten. The one little problem with a zipper is with the weight of the skirt, I definitely need a hook and eye on there. So I hopefully I will be able to use that on my own. I put all the back pieces together first so I could use the sewing machine to put the zipper in. The top of the zipper installation looks pretty good. When one looks closer to the waistline and skirt, it isn’t as great. The heavy gathers and the amount of material did not make it easy to put in by machine. There is a long distance for the front skirt gathers. In fact, I was thinking I would have 2 feet of fabric left after I cut my front skirt pieces. But the front skirt pieces are cut on the fold so it took more fabric than I thought. It used all the last of the fabric I had allot to this project. After serging my silk lining to each piece, I started to work on gathering the skirt. It took several tries to get all the skirt gathered. I had shortened the skirt by 6 inches when I cut the pieces out. After the first try on, I ended up taking off another ten inches from the hem. I probably should have went with 6 inches instead. Now the hem should be around knee length. This dress is very heavy. I didn’t figure a half inch horsehair braid would be enough to help keep the hem fluffy. An inch wide horse hair braid doesn’t seem to help much either. I probably need to make me a really nice crinoline. I have all these red buttons already at home. So I going to use a button closure on the halter instead of a snap. I just need to make sure to reinforce the button area. I want to use the Singer Professional buttonholer that I have for my Touch and Sew 775. Since this would be the first buttonhole in a garment I want to use the Professional buttonholer because it makes it easy getting the lengths even and matching. But before setting up the 775 with the buttonholer, I want to get another item that needs buttonholes too. So this dress will have to wait for a while. 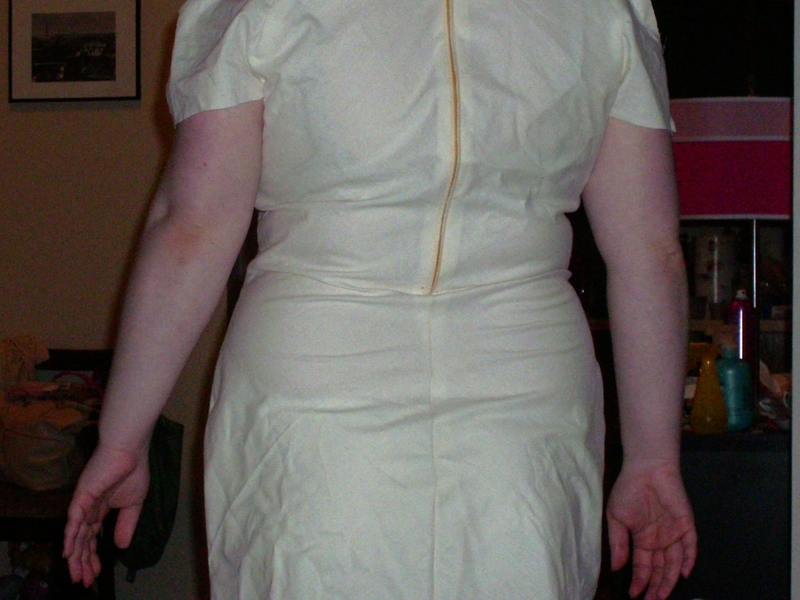 I have a 1960’s Simplicity pattern that I have made a muslin of and marked the fitting changes. So Vogue 2960 will probably need to wait for that one before getting a buttonhole. Besides the fit in the back, there is something a touch off with the dress. I think it is just that it needs a crinoline. But those pictures do have me wondering. Ok, this was too cute to not go back and add. I was taking pictures of this dress so a co-worker could see it. My bunny, Lala, comes dashing across the room so he can be in the picture too. Up next for sure is Butterick 5710 (yes the infamous Pippa dress). 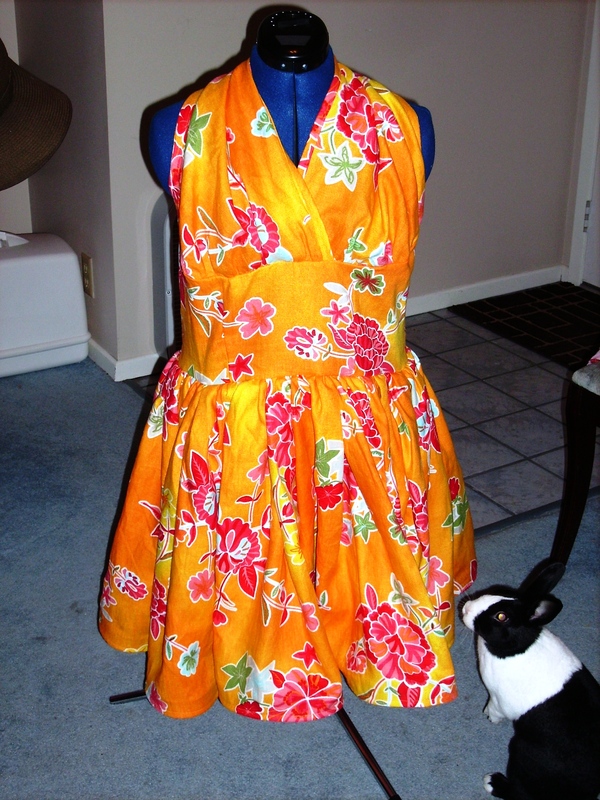 Butterick’s Hollywood inspired challenge really caught my eye. The fabric I have and the bias style of this dress should lend well to a version of Rosalie’s peach dinner dress in Death on the Nile (1976). Of course for my lifestyle, I need to do the short version. I don’t have anywhere to go for a long evening gown. I was able to find a roll of thin fusible interfacing at Joann’s which should help me out a lot with getting a neat machine sewn in zipper. Then, I want to make Savage Coco’s Halter top Hussy pattern in a halter top. This was going to be next until I kept seeing the Butterick Hollywood Inspired challenge which ended up bumping this one back in the box. I have picked out a lovely handkerchief linen for this top. It should be very elegant for the summer. For more practical sewing I have several different blouse patterns picked. Also, I have an apron in the works. I have been working on the hand smocking at work during breaks. So that should help break up the practical sewing some. And I will admit there are a couple more patterns loitering around in the ready to sew box like a night gown (Simplicity 5030) and a slip (Simplicity 4218) but they don’t have fabric already picked out or have been researched. According to the introduction of this pattern in Creating Glamorous Jewelry with Swarovski Crystals, the pattern was inspired by a bracelet that Natalie Wood wore in the movie “The Great Race”. I haven’t ever seen the movie. The one time it was on Turner Classic Movies recently was when I wasn’t at home. The picture in Jean Campbell’s book though looks very classy and the end result certainly didn’t disappoint at all. This bracelet was specifically meant to go with the linen fabric I picked for a 1950’s style dress. Since I wanted to be able to wear this bracelet with other outfits as well, I decided to go fairly simple with the color selections and only picked one of the colors from the dress fabric instead of two. I used the last of my silver seed beads from the Olivia necklace. Then I played with the plain and aurora borealis finish on my colored crystals. I sat trying to figure out what I was supposed to do at Step 1 Curve part. It just didn’t make sense. The picture is only part of the component but I wasn’t really understanding which beads were the ones shown in the figure. I kept trying until tragedy struck. A size 15 silver bead said enough was enough and just broke. So component one was taken apart to redo. I then went ahead and skipped Step 1 Curve part. From what I can tell, it may not be a necessary step. My bracelet looks like it came out fine without this step. 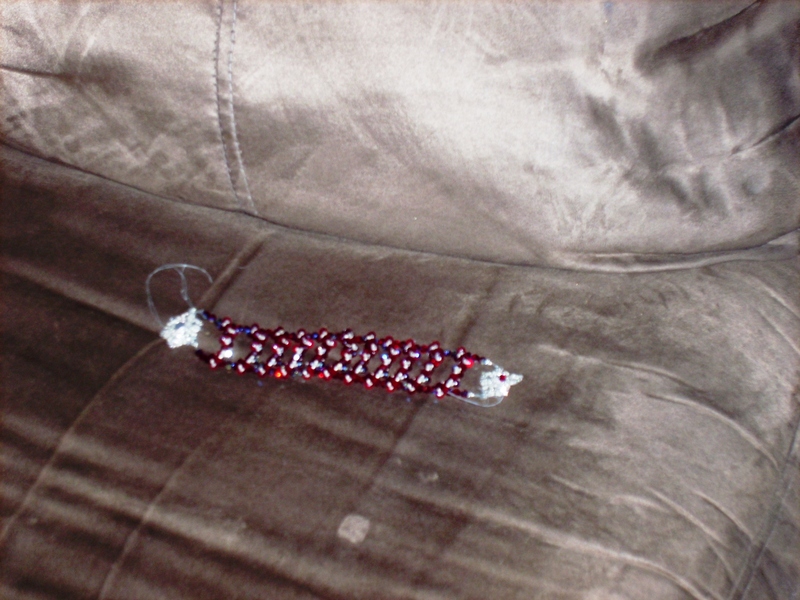 I just could not put a snap clasp in another bracelet. I have troubles putting on the bracelet I put a snap clasp on by myself. This time I tried a mini magnetic clasp. The little clasp is fairly flat. Hopefully the little clasp will work well. I couldn’t find anything else that looked like it would work. Out of the four projects I have made from this book (Marlene, Olivia, Elizabeth, and Maggie), this is definitely the one I would recommend for a beginner. Each link section only took about 20 minutes to make. Each silver disc for the clasp was about 40 minutes. Besides the Step 1 Curve, everything else is pretty easy. After making a couple of links, you don’t even really need to have the book out to finish up the rest of the links. This bracelet could look really cute (and perhaps modern) completed in a multiple colors. This may need to be considered for all the left-over 4mm crystal beads from previous project. A burst of color should make a very spring inspired bracelet. It would seriously be something to consider if I get to needing a quick bracelet for a special occasion or gift. The look can be slightly different by adding more links in. I really think this is the one I should make for my mom. It has a tennis bracelet look that she would like. It may be intriguing to try using the links from this bracelet to make a band around a Christmas tree ornament. It may be something to keep in mind when the next holiday season comes up.